Scottish metal reprocessor, steel trading and environmental services company, John Lawrie Group, has reported record profits for 2007. The latest accounts from Companies House show group operating profits of £4.5m, and turnover for the year ended 31 December 2007 reach £81m. Whilst expansion of the group’s international trading activities, such as the commencement of trading alliances in Canada and New Zealand, cont inues to play a significant part in its success, 2007 also saw John Lawrie diversify into other areas of business. Group financial director, Charlie Parker, said: “Central to our growth strategy is continual investment in our existing metal recycling and steel trading divisions, coupled with the introduction of products and services which share a common link with these core areas of business”. A total of £3.4m was invested in new fixed assets last year, including the installation of the UK’s largest shear for processing scrap metal at the group’s Greenbank Road facility in Aberdeen. This provides the local oil & gas industry much needed support for emerging decommissioning projects. Mr Parker explains: “The term decommissioning has grown in prominence over the last few years. We have carried out a number of projects involving the dismantling of large oilfield and industrial structures, and a range of redundant plant and equipment throughout the UK. With recent investment in plant and expertise, we are now well positioned to further expand and develop this service. 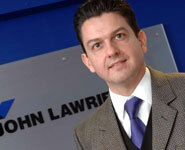 John Lawrie Group has committed £5m for capital expenditure in 2008. This includes the initial development of a new environmental services division, which will bring a vital NORM waste decontamination service to the north-east oil and gas industry. The John Lawrie Group, from its headquarters in Aberdeen, employs over 100 people. The business, which was established some 70 years ago, has operations and stockholdings in the UK, the USA, Scandinavia, Europe, China and the Middle East.